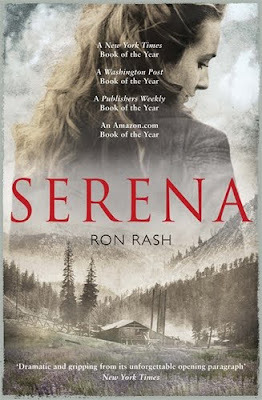 So opens Ron Rash’s Serena, a novel set in the Appalachian Mountains that follows the fortunes of the eponymous central character and her husband as they create a timber barony in 1930’s America. From the cover art on my paperback edition, you might be forgiven for thinking that what follows Rash’s wonderful opening lines will be a novel of romance and tribulation. How delighted was I to find something far more engrossing; both in content and style. What Rash has created here is grand theatre, in the best possible sense. He quotes Marlowe on the cover page and I was struck by just how this novel follows the form of Elizabethan drama. It soon becomes apparent that Serena is no heroine as she ruthlessly pursues her ambition. Nor is Pemberton, her equally ambitious husband, heroic. Whilst he has faint qualms about some of Serena’s methods he is not one to let concern for his workers or his business partners stand in their way. In keeping with Marlowe and Shakespeare a cast of supporting characters are introduced; some major, some minor, some serving to shed light on the characters of the Pembertons and others to provide commentary on their actions. Some are comic, others menacing and yet others heroic in ways the Pembertons will never be. Apart from Rachel, the young girl who has borne Pemberton a child, we are seldom privy to their thoughts, just as we know little of what the Pembertons may be thinking. This is not a novel that presents its characters from within; rather we know them through their deeds and judge them accordingly. And when their deeds are as remarkable as Serena’s a novel less assured than this might rightly be met with some head shaking. Rash however is a very accomplished writer indeed. His work as a poet and his detailed knowledge of Appalachian history, which he teaches as Parris Distinguished Professor in Appalachian Cultural Studies at Western Carolina, allow him to write with power and grace and so detail a time and place where such things seem not only possible but entirely right. He clearly has a deep love for the land and the history of the peoples who have tried to shape it and it is perhaps not going too far to say that in some sense, that Rash has characterised the land itself as locked in struggle with Serena; who embodies the destructive nature of human progress. As she cuts down both trees and people to turn a profit, so the mountains and trees cut down people in their turn. In contrast Rachel is accessible to us, we learn of her thoughts and fears for herself, her son and her way of life. She in a sense is the positive aspect of humanity that is diametrically opposite to Serena. As for the workers and businessmen, some of the supporting cast I mentioned before, they are in turn awed and cowed by Serena and what she represents. Some strive to do her bidding, some seem to venerate her and some rightly fear her. None it seems can fathom where she came from or what drives her on. In this she is like the great eagle she trains to hunt snakes; beautiful and terrible and utterly unafraid. In writing the above I am conscious that I have yet to discuss plot. Again, rather like the Elizabethan drama, Rash uses plot as a canvas upon which to paint his scenes and to comment upon the actions of mankind. That said, the story is entirely satisfying and centred upon Rachel who can bear a child and so sustain a future and her struggle with Serena who is barren and can leave no legacy save through destructive force of will. In parallel with this, the book details some of the events surrounding the establishment of the National Park in the region and the impact this had upon business and livelihood. This second narrative is also concerned with sustainability versus profit, industry versus nature and is as relevant today as it was then. It is not however the reason you should read this book. Instead read it for its remarkable sense of time and place and Rash’s wonderfully vivid recounting of people and events set in a hostile yet magnificent landscape. By all means reflect upon how man and nature may come together and for what purpose but at the same time simply enjoy what I found to be one of the most engrossing and substantive books I have read for a long long time. Terrific review. Your enthusiasm is clear and strong, yet your description of the story and style is distinct enough to let me know this is the kind of book I read best while on vacation. Unlike many people, I can rarely give history or mountains their due Monday through Friday.